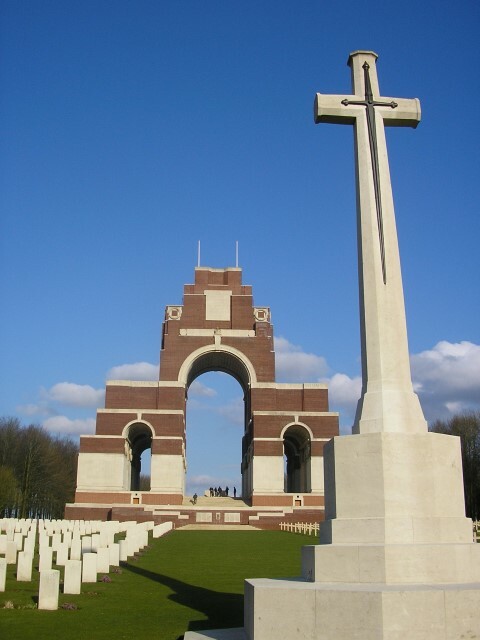 18/1628 Private William Edwin Earl, 14th Battalion, the Durham Light Infantry was killed in action, 27 September 1916 and is commemorated on the Thiepval Memorial, France. He was 19 years old and is commemorated on the Evenwood War Memorial and the Roll of Honour, St. Paul’s Church, Evenwood. In 1911 the family lived at Walworth, High Conniscliffe near Darlington where 51 year old William worked as a game-keeper. After the war when the Imperial WGC collated details of those who had died, William’s father had died and his mother lived at Buck Head, Evenwood. He enlisted at Darlington and Walworth was his recorded residence. The 31st Division served in Egypt 23 January – 6 March taking over the defences of the Suez Canal (No.3 Sector) and then sailed for Marseilles, France to serve on the Western Front for the duration of the war. In 1916, it saw action at the Battle of the Somme – the Battle of Albert and the Battle of the Ancre. What became known as the Battle of Morval took place in the days following 25 September 1916. This town is situated in the southern sector of the British 4th Army’s theatre to the north of the French 6th Army. The objective was to drive the Germans from their positions in the vicinity of Gueudecourt, Lesboeufs, Morval and Combles. The XIV Corps comprising the Guards, the 5th and 6th Divisions were faced with capturing the fortress villages of Lesboeufs and Morval. As was customary, the offensive commenced with an artillery bombardment which opened up on 24 September. On this occasion, the Germans had no time to deepen their trenches or prepare deep dugouts, concreted machine gun posts and massed belts of barbed wire. The infantry went over the top at 12.35, 25 September. The offensive purposely coincided with a French assault to the south. The Royal Artillery blasted a “creeping barrage” and the infantry followed into No Man’s Land. Tanks were to be used in the attack behind the troops and concentrate their fire power on specific strong German positions. The village of Gueudecourt was still holding out as night fell. The real success was to the right on the front where the XIV Corps, packed into a narrow frontage to maximise their penetrative power swept forward to dramatic effect, eventually capturing the whole of the German front line system. The objectives of Lesbouefs and Morval were taken. In many places along the line the troops of the XIV Corps met little opposition from front line Germans and they smashed their way through. The village of Combles was left isolated and the Germans had to abandon it the next day, 26 September. Gueudecourt was finally overrun on the afternoon 26 September. That day, 14/DLI went to the front line east of Lesboeufs. By the conclusion of this offensive, the final objectives had been achieved and in addition land had been captured beyond the villages of Lesboeufs and Morval. “Sept. 25 – General attack – 6th Division on Lesboeufs and south to Morval – by 16th and 18th Infantry Brigades with 71st Infantry Brigade in reserve – successful – over 500 prisoners. “The Division had taken part as a whole in 3 general attacks on the Somme (15th and 25th September and 12th October) and had also carried out subordinate operations on the 13th and 18th September and the 18th October. Appendix 1 provides information that the Division suffered 7,430 casualties between 5 August and 23 October 1916 on their tour of the Somme. The British battlefront extended from the region of Leuze Wood, east of Guillemont to the vicinity of Martinpuich. The 14/DLI made its first appearance in the Battle of the Somme. 12 September: 6am, General bombardment of the German lines began. 14/DLI moved up from Sand Pit Valley to the Citadel, south of Fricourt. Later in the day, the 18th Brigade rushed into the Quadrilateral from the flanks and 2/DLI entered a trench called Low Road, bombed it down for 100 yards and held on. At night 14/DLI were sent forward from Guillemont to consolidate a position where the railway crossed the Ginchy-Leuze Wood road. The trenches were full of dead and wounded Norfolks and Suffolks. 13 September: dawn patrols sent out to locate troops on the flanks. Further fighting to the north where the Guards attacked Lesboeufs. 14/DLI began work on an assembly trench in front of their position for another attempt upon the Quadrilateral. 14 September: early morning, heavy enemy barrage, counter attack expected, did not happen, resumed work on the trench. 15 September: work on another assembly trench 70 yards further forward. 24 men were wounded before the actual attack started. 18 September: 5.50am, 14/DLI climbed out of the wet trenches and plodded forward following the creeping barrage. On the right and the centre the line made good progress but on the left, “German machine-gunners maintained a galling fire”. Rifle grenades were used and the machine guns were soon in British hands. The Straight and the Quadrilateral were taken, the advance pressed on. North of the railway, 14/DLI bombed out dug-outs and reached the forward slope in view of Morval. The battalion dug in. The expected enemy infantry counter attack did not materialise but German gunners opened fire on the new positions. At night, the whole brigade was relieved and 14/DLI reached billets at Meaulte, the following day. 4 officers and 31 men killed, 4 officers and 161 men wounded and 32 men missing. 106 unwounded Germans had been captured and 6 machine guns. 21 September: a draft of 80 men had been received before 14/DLI moved forward again relieving the 1st Guards Brigade in front of Lesboeufs. The night was spent in reserve between Trones Wood and Bernafay Wood. 23 September: evening, 14/DLI moved forward and relieved 2/DLI and 11/Essex, taking over the whole of the brigade front just south of Ginchy-Lesboeufs road. The Germans occupied Cow Trench on the left beyond the road. Hostile shell fire. 24 September: dawn, the German infantry advanced under intense bombardment. They did not reach the trenches of the 14/DLI. British gunfire prevented further enemy attacks but many shells fell short into the trenches of the 14th. At night, the battalion was relieved by the 2/DLI. Losses 1 officer killed and 10 men wounded. 25 September: the 2/DLI & 14/DLI participated in the attack along the whole allied front from the river Somme to Martinpuich. The 1st West Yorkshire Regiment was successful in “making good” the village of Lesboeufs but 14/DLI were not called upon and sat in reserve positions all day under a heavy German bombardment – 1 officer and 2 men killed, 2 officers and 32 men wounded. Private William E. Earl was killed in action 27 September 1916. He has no known grave. 29 September: evening, 14/DLI arrived at billets in Meaulte and the focus of the Somme offensive moved to the north and the Battle of Thiepval. Later research records that 14/DLI lost 8 Other Ranks killed in action or died of wounds 27 September 1916. The following account was provided by a Guardsman fighting in the same area as Private William Earl and it is likely that their experiences were similar. “Out of the trench and there was no barbed wire in front. We met the usual machine-gun fire, the mistake to me was blowing a whistle before the attack; another way could have been found which was silent. As soon as the whistle went the Germans must have known the attack was on its way and they were ready. Returning to the Battle of Morval, it appears that the tactic of “bite and hold” was successful in this instance due to the effective preliminary bombardment, the “creeping barrage” which provided cover for the infantry and the relatively weak German defences. A concentrated attack with limited objectives was supported by a French offensive to the south which further occupied the German defensive cover. Thus the British edged forward as the Germans edged back and prepared new lines of defence. Private W.E. 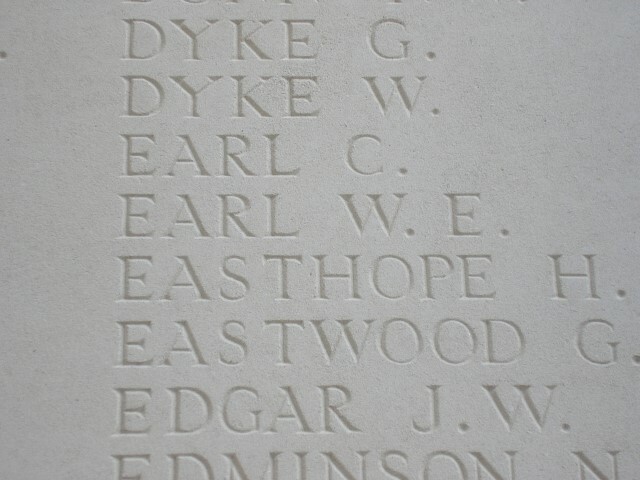 Earl has no known grave and is commemorated on the Thiepval Memorial, the Memorial to the Missing of the Somme. The Memorial bears the names of more than 72,000 officers and men of the UK and South African forces who died in the Somme sector before 20 March 1918 and have no known grave. Over 90% of those commemorated died between July and November 1916. “Durham Pals – 18th, 19th & 22nd Battalions of the Durham Light Infantry in the Great War” Sheen J. p.316 Note: age recorded as 28 years old. Various sources including www.cwgs.org/somme & “The Somme” Hart P.